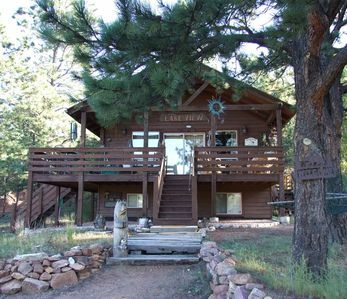 Enjoy a secluded mountain vacation in Pikes Peak Region of the Rockies surrounded by the Pike National Forest. 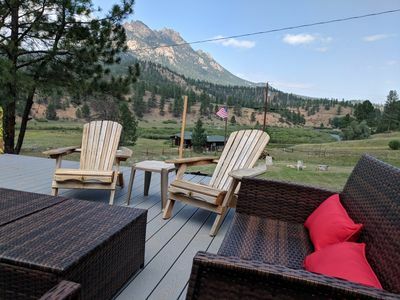 Our fully furnished home is located in a pristine environment, wildlife sightings and magnificent sunrises/sunsets and night skies in addition to hiking trails, fishing and other activities. 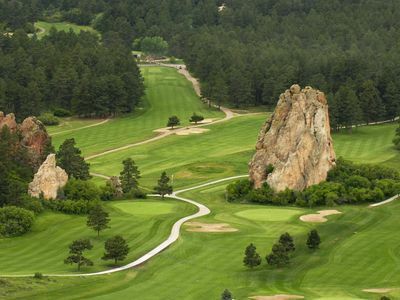 Only 15 miles to beautiful WOODLAND PARK with all city amenities, 30 miles to COLORADO SPRINGS. 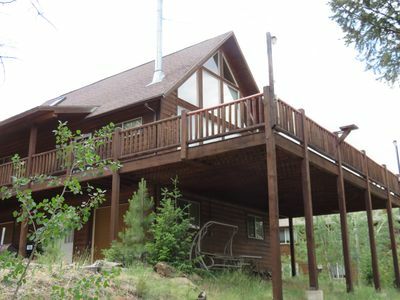 PANORAMIC MOUNTAIN AND LAKE VIEWS, PRIVATE LAKE, PIKE NATIONAL FOREST IN THE BACKYARD! 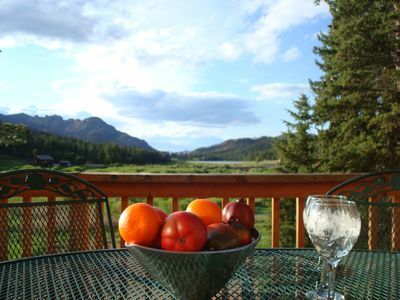 MOUNTAINS OF THINGS TO DO: FISHING, HIKING, PICNICKING, FOUR-WHEELING... RESTAURANTS AND SIGHTSEEING 15 MIN AWAY! 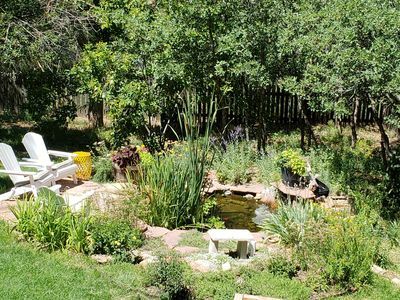 GORGEOUS NATURE AND WILDLIFE; PEACE AND QUIET! 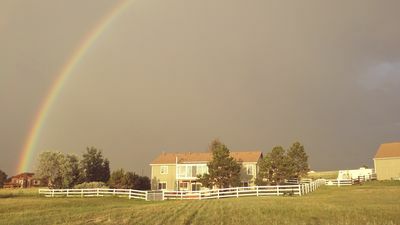 PARADISE FOR ARTISTIC PHOTOGRAPHY AND PLEIN AIR PAINTING... KIDS WILL LOVE IT TOO: TONS OF TOYS, BOOKS, DVDS, TENTS FOR KIDS OF ALL AGES. 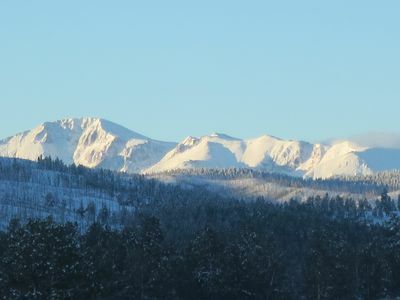 PIKES PEAK RETREAT is a custom designed COLORADO VACATION HOME. 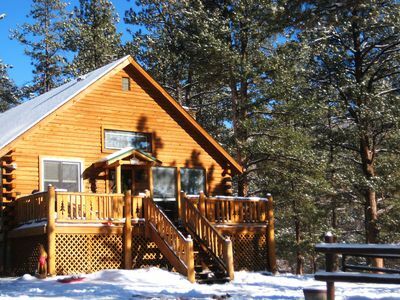 It offers all the comfort and charm of MOUNTAIN RETREAT, with panoramic view windows, 2 big spacious decks with Pikes Peak and mountain views. At sunrise and sunset, colors play off the rocks in a constantly changing show...Each guestroom is tastefully appointed. 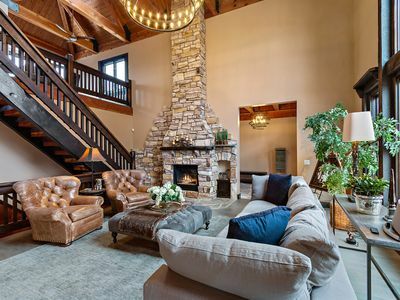 Neutral earth tones add to the tranquil environment for your comfort. 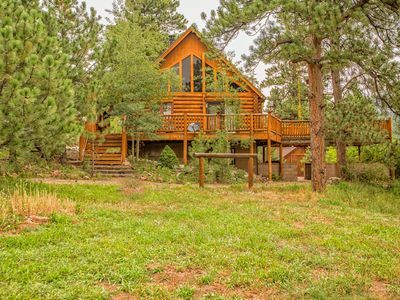 Settle into quiet relaxation or take off to enjoy the forest, the mountains and the lake, hiking trails, and prolific wildlife. Walk across the street to the lake or a creek a a few steps away. 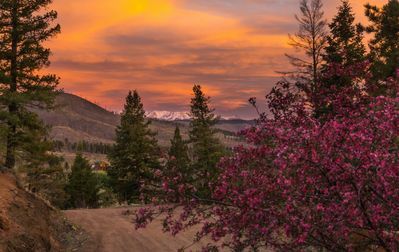 In the spring, wildflowers bloom along the pass you'll probably want to take down to the lake. 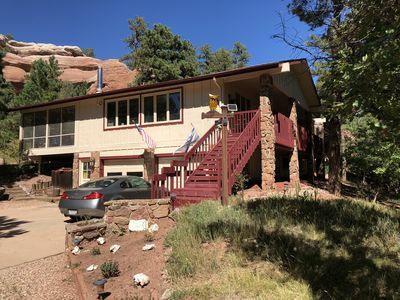 PIKES PEAK RETREAT is a perfect home base for exploring Pikes Peak Region: Woodland Park, Cripple Creek, Historic Manitou Springs and Historic Old Colorado City(a part of Colorado Springs) and Colorado Springs. 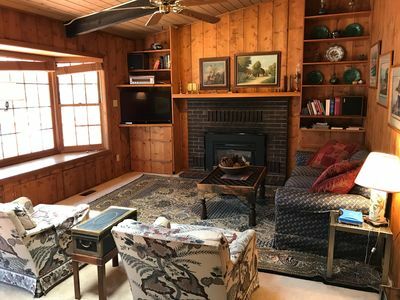 You will find a lot of information about area attractions, maps and visitor guides in the living room. 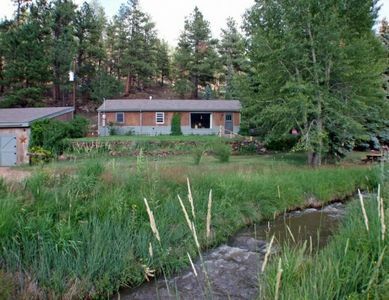 Fly Fishing – Gold Medal fishing can be found in the famed South Platte River located approximately 7 miles from the property. Gill Trail offers Gold Medal catch-and-release fishing along the Platte River. You can go cross-country skiing right from the doorstep. 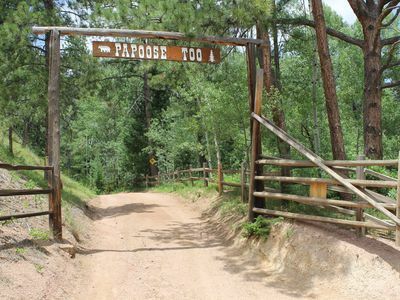 There are motorcycles, ATV and four wheel drive trails and roads in the adjacent Pike National Forest. Great trails for mountain biking. No need to bring your bike you can rent bikes and get trail information at Woodland Park Shop (Team Telecycle). 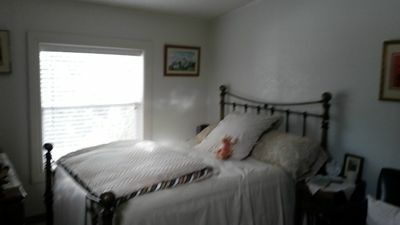 The house is perfect for 6-8 adult guests or 6 adults and 2 children. 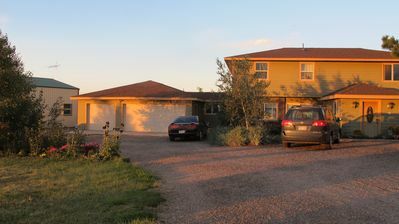 Total occupancy is 8 guests as per the fire code and capability of our septic system. Peaceful Country Living, Near Colorado Springs and Castle Rock, Great Views! Beautiful Country Ranch. 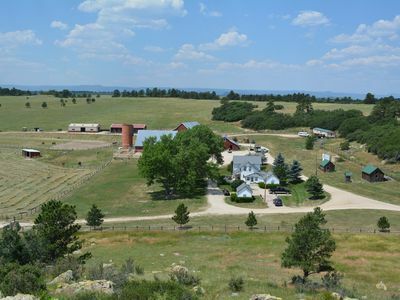 Stunning Views,pets, Camper For 6 & Tent Sites Too!